New strategies demand new processes. And in a digital world, new processes demand new technology. This couldn’t hold more true for the burgeoning content marketing sector. We’re fond of saying that content is the atomic particle of all marketing. Without it, there’s no owned media, but also no social, no PR and no advertising (where it’s called “creative”). Brands and agencies alike are scrambling to create content, and also to distribute it, measure it, target and optimize it. To do so, they require tools. 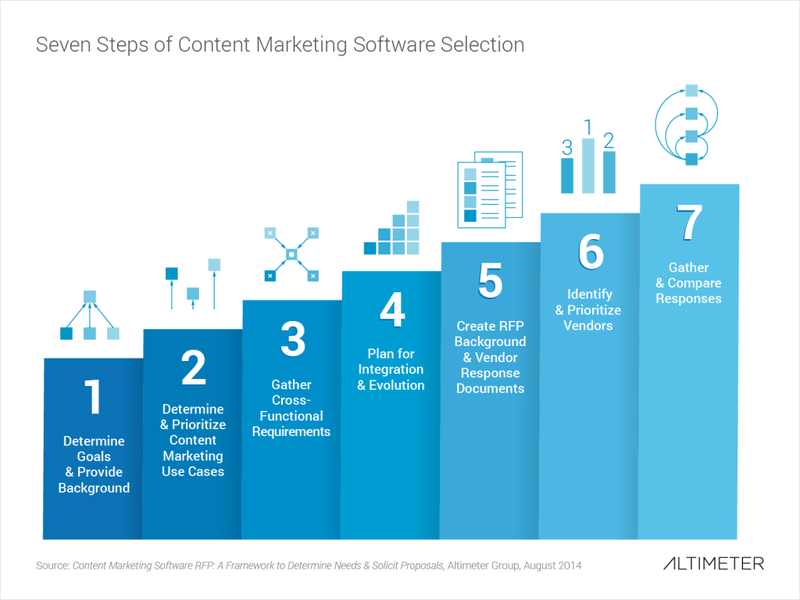 Altimeter Group recently took a hard look at the burgeoning content marketing software landscape, and helped break down content marketing into use cases and scenarios to help marketers identify their needs as well as pinpoint the vendors in the space who might be able to address them. But that’s only the beginning of a solution to a large disconnect between need and solution. As a content software vendor recently put it, “Most brands aren’t yet able to clearly articulate their content marketing needs or end KPIs. This makes creating an RFP and asking the right questions incredibly difficult.” Brands [and agencies] can’t frame “what’s needed” or how to get to the end goal. Establishing content governance, processes, strategy, and inter-departmental coordination. Matching content software needs to planned investments. Finding solutions that scale toward the future (e.g. new technologies, vendor partners, or channels). Scoping software integration requirements, both with other marketing software, and often with enterprise software packages such as CRM or customer data. Accommodate existing workflows and processes – it’s much more difficult to retrofit process to software than the inverse. Winnow down to a shortlist which vendors may meet requirements. Our report includes a two part, customizable template that guides marketers and agencies through our recommended process. First, by helping them to conduct an internal assessment and soliciting key stakeholders for input and priorities. And second, creating an RFP to be used with selected vendors. This second part contains both essential background information and a response sheet for the vendor. All in all, there are seven steps to this process, including looking beyond marketing into cross-functional needs, as well as integration with other software systems. We hope our report and template facilitates your own proposal process, and welcome feedback on where it’s working, and where it can use improvement. Join me for a webinar on September 11 when I’ll share best practices for your content marketing RFP process. Thanks for sharing Rebecca! Almost done with your last book and loving it.